Lawyer Ayn Traylor-Sadberry publishes final article in her series on "Paralegals"
BIRMINGHAM, Ala. - Dec. 15, 2018 - PRLog -- In her final published article in a series on the paralegal occupation, Alabama Family Lawyer Ayn Traylor-Sadberry reviews types of paralegals and their work assignments. The complete articles will be published on the Blog of Ms. Traylor-Sadberry at https://AynTraylorSadberryBlog.blogspot.com. Paralegals are qualified to perform their responsibilities by completing an educational program, receiving training on the job, or through actual work experience. They do not undergo the rigorous training of Attorneys, nor are they licensed like attorneys. Paralegals sometimes perform "legal" work that otherwise would be done by attorneys. However, the supervising Attorneys remain fully responsible for any legal work delegated to a Paralegal and must always supervise the Paralegal's work. There are several different types of Paralegals, the designation depends upon the required education and training. Examples are: A Certified Paralegal is a Paralegal who has completed the voluntary certification process of a professional association by developing a specified level of professional competency. The various accreditation bodies include: The National Association of Paralegals (NALA) which awards the designation of CP (Certified Paralegal) and CLA (Certified Legal Assistant) to those who meet their specific requirements and complete the competency examination. NALA also governs certain Advanced Specialty Certifications (CLAS) programs, and there also exist certain state-specific advanced competency exams. The continued usage of Paralegals in the profession is also a mandate of pure economics. Paralegals play an indispensable role in the legal profession, and if the predictions are correct, that indispensable role will continue to expand as economic pressures force law firms and businesses to become ever more cost-effective. While the job outlook for Paralegals is bright, this may adversely affect Attorneys, whose work will migrate as much as technical and ethically possible to Paralegals. Just as a doctor's workload may in part be handled by nurses or nurse practitioners, a lawyer's workload will end up where it is most cost-effective (subject to professional and ethical rules). The only constant in life is change, and this is just another example of how times are changing. The drum computer has to a large extent replaced the drummer in a band or studio recording. The remote-controlled drone has in part replaced the fighter pilot. The taxi driver may soon be replaced by Google's or Uber's self-driving cars. To say it with Bob Dylan, the Times They Are A-Changin and the profession must adapt to new economic realities. 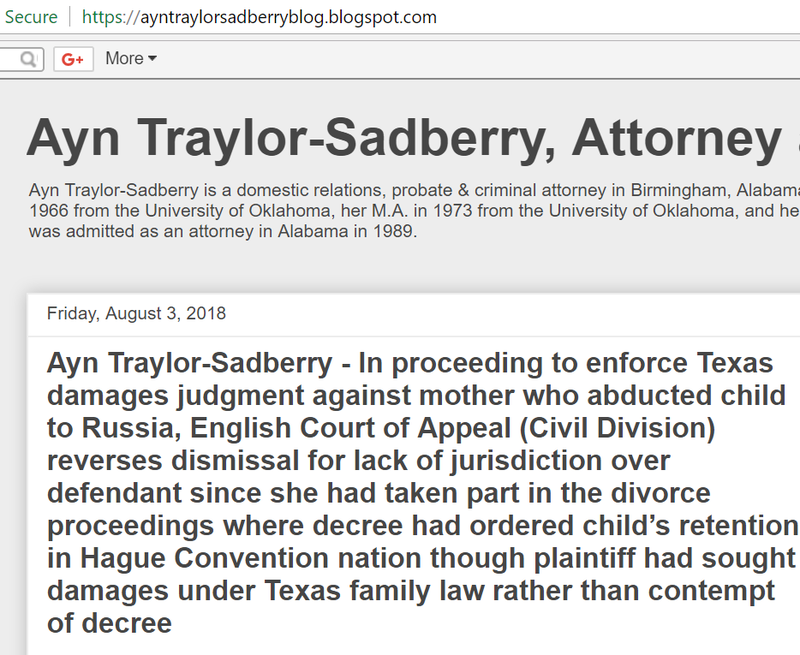 Ayn Traylor-Sadberry is a domestic relations & family law attorney in Birmingham, Alabama. Ms. Traylor Sadberry received her B.A. degree in 1966 from the University of Oklahoma, her M.A. in 1973 from the Oklahoma City University, and her Juris Doctor from Howard University School of Law in 1981. She was admitted as an attorney in Alabama in 1989. Law Offices of Ayn Traylor-Sadberry, P.C. : Law Offices of Ayn Traylor-Sadberry, P.C.